Nick Veres joined the Lendello team in August of 2018. Prior to becoming a member of Lendello, Nick assisted his clients in obtaining home financing throughout Alabama. He specializes in Conventional, FHA, USDA, and VA loans. He also has experience and a wealth of knowledge in renovation and new construction home loans. He prides himself on going above and beyond for his clients to ensure they receive the best customer service possible and enjoy a smooth mortgage transaction. Nick is originally from Montgomery, Alabama, but relocated to Birmingham after graduating from the University of Alabama. 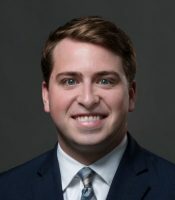 Shortly after graduating from UA, Nick started originating home loans throughout the state of Alabama. He is married to the former Elizabeth Donahue of Vestavia Hills. Click Apply Now to start your loan application. Please use your best estimate if documentation is not available. After you have completed your application, we will contact you to complete the application process.